While visiting Marthas Vineyard last weekend, I discovered Danielle Mulcahy, Illustrator, Filmmaker, and Multimedia Artist. I bought this small strand of felted acorns she made so I would remember her. I just spent some time looking at her website, and loved her short films. "I find appreciating the simple beauty and joy in life is achieved more easily with a companion. When I am by myself, quite often, I become very focused on the thoughts in my mind, the endless chattering in my head, lists of things to do, goals, concerns, conversations I want to have, things I should or should not do, but when I have a quiet moment with someone close I tend to live more presently and in the silence of comfortable companionship. Then I am able to be in the moment and to look around me for something beautiful I can share with that friend." I've been making some new necklaces and wearing them around to see what kind of response I get. This moonstone necklace has been very popular, and I have to say it's become one of my favorites. 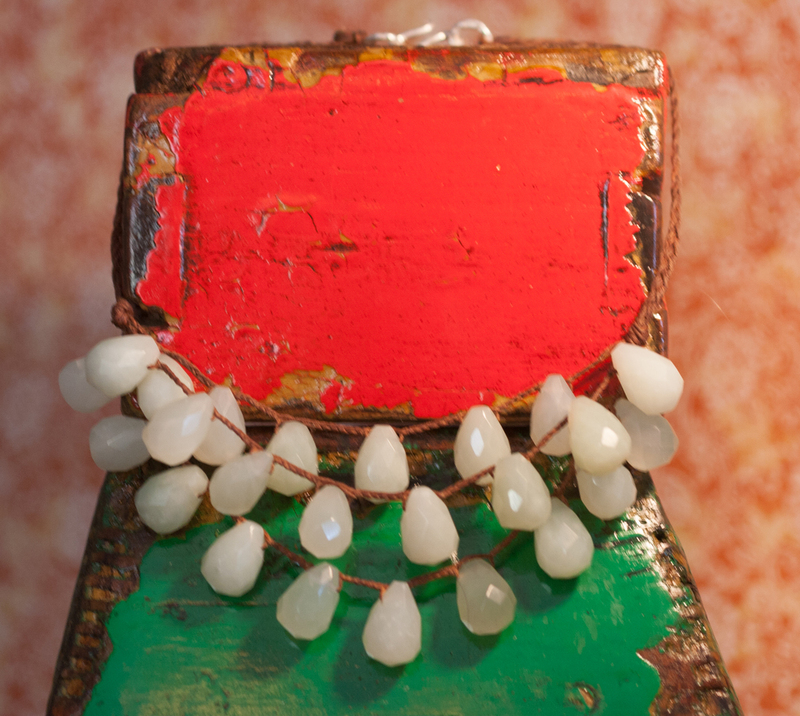 These moonstone beads are so beautiful and luminescent...and expensive! Danielle's acorns reminded me of the work of my lifelong friend, Lisa Ghriskey. Lisa is an amazing multimedia artist. If you are interested in seeing more of her beautiful felt animals you can contact me.